Tra la la…Oh We Do Like To Be Beside The Seaside… – Run. Ride. Roam. Breakfast doesn’t get much better than that! Sitting on the third floor (top floor) of our small hotel, at the floor to ceiling windows, looking out to sea, with the sun sparkling on the water. Magic. We lingered just a little longer over our muesli, to make that spectacular morning vista last a little longer. On returning to our room, we continued to gaze from our balcony, at the sun on the water, the small fishing boats chugging along on the waves and the flocks of sea birds following behind and circling for fallout. Just a perfect scene and it was all ours. Very special. Very lucky. We eventually dragged ourselves away from our sea view, saddled up our bikes and pedalled off along the roads and streets of Anzio. 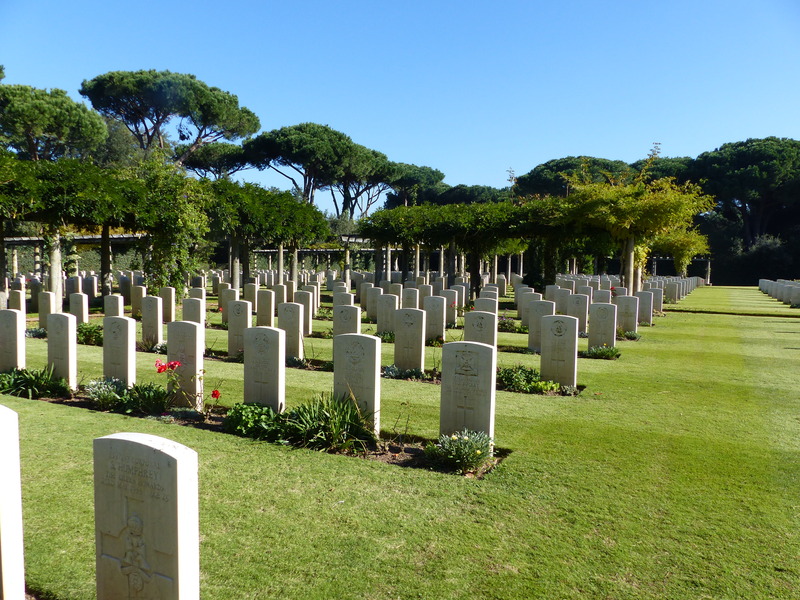 We’d wanted to explore some of the history of the area, so we rode up to the Commonwealth War Cemetery, to learn a little more about the Battle of Anzio. This was another war cemetery that was an incredibly moving place. Like the others we’ve visited, it was peaceful and beautifully maintained. In fact, it’s the first beautifully maintained place we’ve seen during our time in Italy. It was very moving to see the lines of white headstones, as we’ve seen in other, similar cemeteries and it still staggers me, to see the numbers and the ages of those who lost their lives. The war in Italy was quite different from other campaigns, because it was predominantly mountain warfare. That’s something that hadn’t occurred to me before and something I hadn’t really heard or considered. We’ve heard a lot about trench warfare, such as on the Western Front, jungle warfare, as it was in the Pacific and places such as Kokoda and desert warfare in the Africa campaigns during WWII, but I hadn’t considered mountain warfare. Apparently the British and American forces were unprepared for such conditions and it was only the Indian and French forces who were trained to fight in mountainous terrain, with the standard equipment such as tanks, being of no use. Mules and jeeps were put to use, rather than tanks. The Battle of Anzio began on January 22, 1944 with Operation Shingle, an amphibious assault on Anzio. Despite early successes, the Allies soon came under fierce counter attack from German forces and nowhere was out of range of the German guns and Luftwaffe. The soldiers of the British and American Divisions involved in the Battle of Anzio endured sustained artillery and sniper fire and suffered huge casualties. The fighting continued relentlessly until May, when the Allied Forces finally broke through. 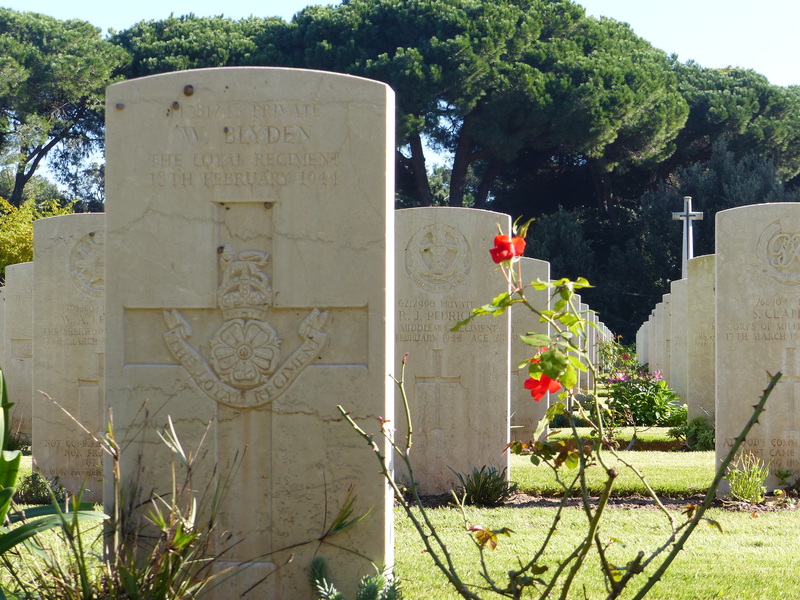 In the last four days of fighting at Anzio, one battalion suffered more casualties than in the previous eleven months of combat. Two-thirds of those buried at this cemetery are soldiers killed during Operation Shingle. Through a long lane of memories, you often wander back. And in his young eyes, a sudden glory shone and he was gone. How hard it is to part without a final farewell. I’ll walk beside you in the land of dreams. We will remember them. To the world a soldier. To us the world. He gave the greatest gift of all. The gift of his unfinished life. He planned a beautiful future only to end in a dream. I saw a Harold from Nottingham, who left behind his wife Doris. There was also an Ernie from Nottingham, loved and remembered by his wife Edna. It was something about those names that touched me. Harold and Doris and Ernie and Edna, so normal, so British, such homely names. I could imagine them sitting down to their Sunday roast or Ernie coming home from the pub, while Edna brushed down her apron after an afternoon in the garden. Harold and Doris might have walked hand in hand through the park, talking about the future, or where they might go for the bank holiday weekend. Those peaceful, ordinary lives, lived and enjoyed by Harold and Doris and Ernie and Edna were shattered by the brutality of war. I found it quite emotional, being there and seeing the names of people I didn’t know but could only imagine. After spending some time at the war cemetery, we rode off, in the sunshine, thinking again, how lucky we were to be here and to be living as we were in peace, unlike those names we had just left. We pedalled off towards the beach and off towards the nearby town of Nettuno. 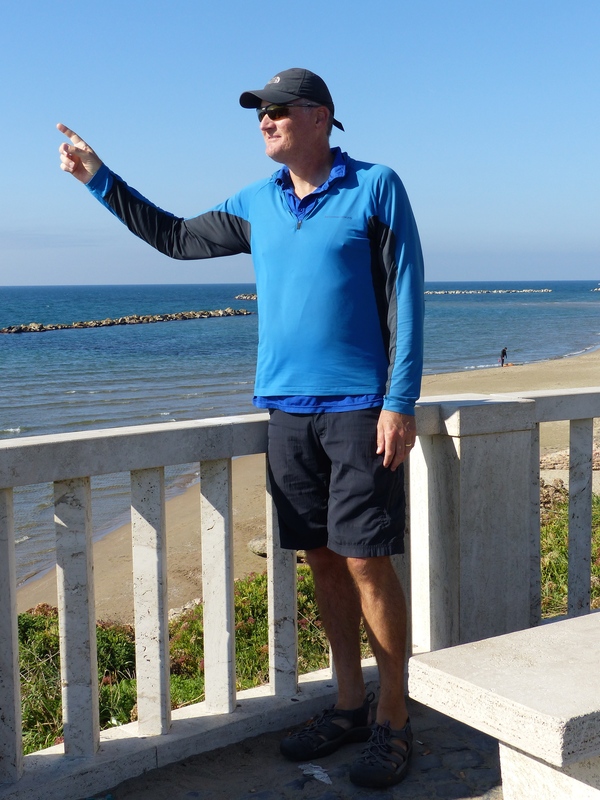 On the way, we stopped by the beach to look across at Nettuno in the distance. 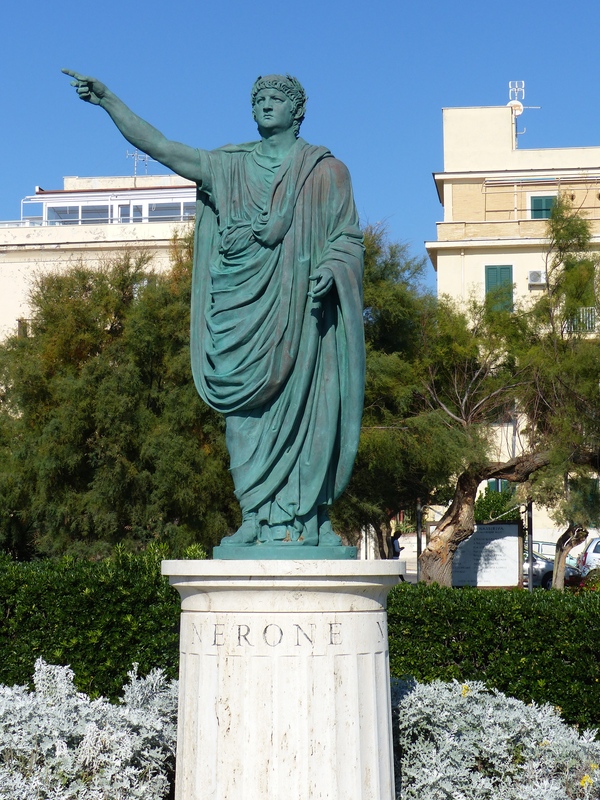 We paused to look at a statue of Emperor Nero. We’ve been somewhat amused by the poses struck by the subjects of sculpture and paintings that we’ve seen. Looking at the paintings in the galleries in Paris and the various statues we’ve seen, they all seem to be drawing our attention to something very important in the distance! They like pointing! The “purposeful point” seems to be the pose of choice. Having seen this pose so often in stone, marble of oils, Steve decided it was now going to be his pose of choice for all future photos. If it’s good enough for Emperors he decided, it’s good enough for him! 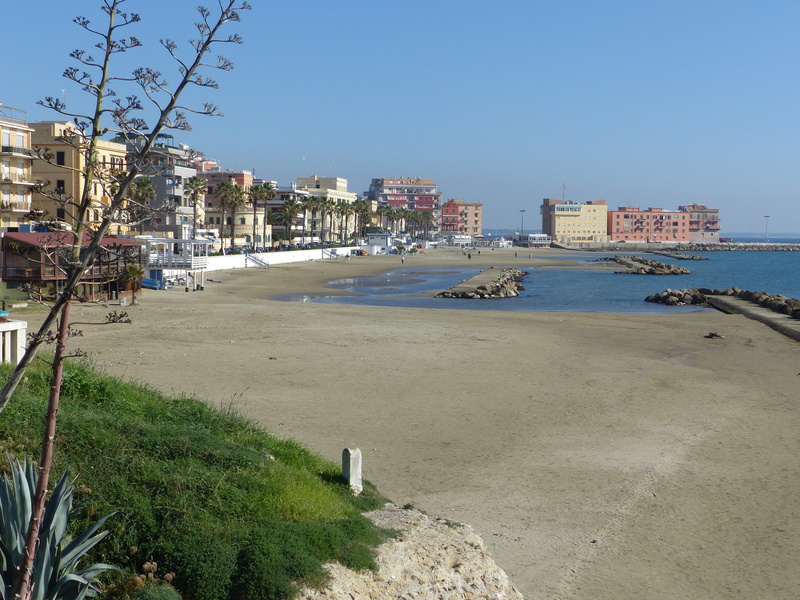 Nettuno was a beachside town, bigger than Anzio, and a nice place to ride around and explore. , We found a small, beachside coffee hut where we stopped and ordered a pot of tea, sat on the plastic chairs and had a moment in the sun, looking out at the beach and sparkling water. We love being by the seaside! We then pedalled off and found a small organic cafe, where we had a light and tasty lunch, before riding back to Anzio and our room with the balcony. We ended up pedalling around for 22km, so the bikes got some exercise rather than a complete day off. As soon as we returned, I did a quick change and headed out for a run. I actually did something I have never, NEVER done before. I ran in shorts! I never run in shorts! I always cover up my knock knees and bandy, wonky legs with leggings. Today though, the sun rendered me temporarily brave and I decided there was no wildlife around to scare and the worst I could do, would be to give someone something to laugh at, and I could live with that, so off I went with my wonky legs on full display. I plodded along beside the water for 10km and had a few cars honk, which I think was the auto version of having a good laugh at the lady with THOSE legs that should not be inflicted on the poor unsuspecting public. It was good to be running again though. Leg alert! Steve was being a paparazzo on the balcony! 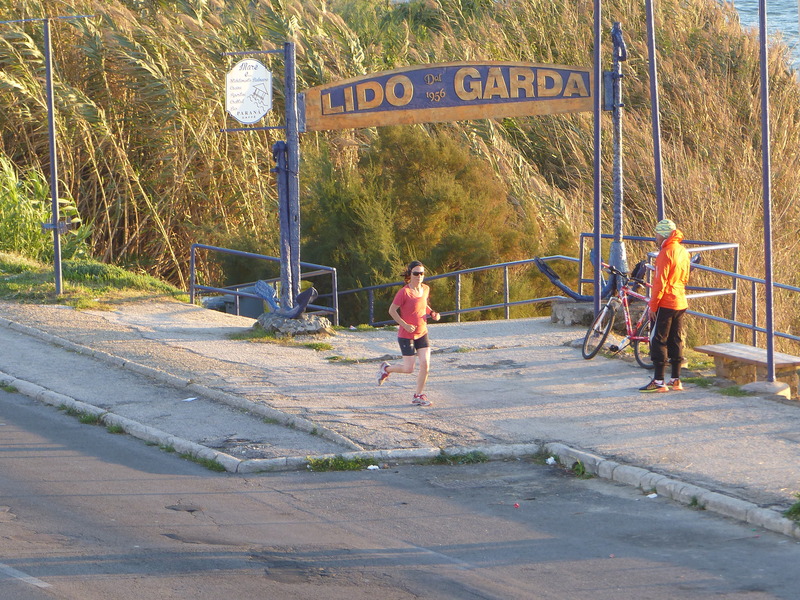 A day by the sea, in the sunshine, with some riding and running along the Italian waterfront. Molto bene!! We can’t believe that after months and months of woolly weather, we have had almost two weeks of sunshine! Unbelievable! Right at the end of things, we get glorious weather and just as we are about to leave Italy, it turns on the weather magic for us! Oh well, we are loving it for every last minute we have it! If it’s taken until now to receive the gift of sunshine and warmth, we will receive it with gratitude! We are loving seeing the sun shine, we are loving seeing the twinkle of the water and the waves and loving being able to dust off the t-shirts again. I’m just really, really sorry, that the warm weather also leads me to dust off the shorts. Sorry Italian public, for the sight that is my lower-half. I hope I haven’t caused any permanent damage to anyone’s vision or made too many babies cry. Sorry for the legs, thanks for the sun though! Thanks a million for that! Stoked to have you back with us dear Jan! Glad to hear all’s well there. I’ll try and strike a pose sometime, I’ll try and steal one from another statue, if I can find one who isn’t pointing!